Descent set of safety features. 2018 Sorento is now up for grabs in Malaysia. Also, recently Sorento 2.4 EX variant was made available to us. The car is positioned above the Sportage as a proper full-size flagship seven-seater SUV from Kia. The SUV has been on sale for quite a long time, which has made it look a bit dated in terms of visual appeal, thus a new model was more than necessary. Despite its size, the Sorento looks a bit understated, thanks to a rather flexible design approach with more focus on rounded curves and edges. And when it comes to interior design, the Sorento doesn’t appeal too much due to the simple and quite dated layout of the dashboard. Adding to it, the lack of many new age features deter its overall appeal as a full-size SUV. However, in terms of comfort, space and ride quality, it is imposing. The Malaysian-spec Sorento gets only two powertrain option – a 2.2-litre four-cylinder and 2.4-litre engine. Have a question on Sorento? Sorento is available in 8 different colors - Clear White, Snow White Pearl, Silky Silver, Aurora Black Pearl, Gravity Blue, Metal Stream, Platinum Graphite and Rich Espresso. Well it is almost 20 years ago, when Kia launched its first SUV model Sportage and since then the brand has never looked back. 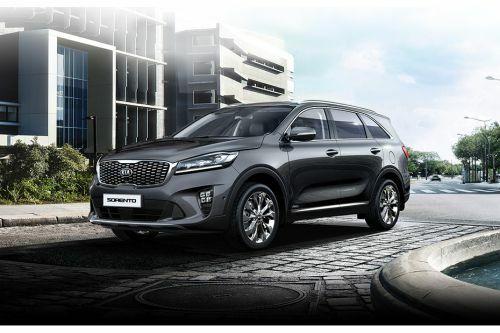 With the launch of a facelifted version of Sorento, Kia Motors have set another benchmark in the Malaysian auto market. Following with the legacy, the refreshed new design of this SUV is worth overwhelming. Honeycomb radiator grille at front with mat black finish, enables the vehicle to transport ample air to the engine bay. LED daytime running light offers clear vision even in the deepest darkness. Apart from providing easy visibility during foggy days, fog lamps at the front avails you with static bending feature, that enables one to explore the corner areas during turning. Electrically adjustable ORVM have LED repeater lamps integrated in it. LED rear combination lamps adds a sporty impression at the rear. Roof rails at the top enables easy import of outdoor equipments. Wide panoramic sunroof of the car lets sufficient sun rays to enter inside. Chrome coated door handles are integrated with pocket lamps that lets you open the door even in dark. The advanced new center fascia with steering mounted controls provides a plethora of controls, which eases the way of driving. Dual separate air climate control offers personalized zone of cooling. Centre console of the Kia Sorento allows you to switch various driving modes. Seats with Nappa black leather upholstery provides comfortable ride all through the journey. AUX, iPod and USB connectivity enables you to listen your favorite genres. A 7 inch TFT LCD supervision cluster of the SUV provides ample display of driving parameters. Flexible seating arrangement of the SUV offers a generous space inside. Active head restrain and 8-way power adjustable driver seat offers decent comfort to the driver. There are 60:40 split folding 2 row seat along with 50:50 folding 3 row seats that provides ample boot space to accommodate massive luggage. Electronic chromic mirror prevents the glare from the rear traffic. The 2.4 DOHC DCVVT THETA II engine of the Sorento churns out a maximum power of 174 hp at 6000 rpm and boosts a peak torque of 227 Nm at 3750 rpm. Claiming to touch 100 km/h in just 10.5 seconds, its 6-speed automatic transmission offers a top speed of 190 km/h. Vehicle Stability Management of the SUV incorporates a couple of decent safety features- electron stability control, ABS/EBD, traction control system and hill-assist control. Rear parking assist system alerts the driver while parking in tight areas. Interior of Sorento is the true blend of quality material and fit-and-fine finish. Driver oriented center fascia of the dashboard has decent set of ergonomically arranged controls. Nappa tailored black leather upholstery of the SUV brings a luxurious feel to the interior. Active head restrain with 8-way power adjustable seats and sliding center armrest ensure sufficient comfort to the driver as well as to the passengers. Dual zone full auto air conditioning with cluster ionizer offers personalized temperature zones. Air vents at the 2 row and third row enables ample cooling for passengers at the back. Trip computer with 7” TFT LCD supervision cluster gives a wide range display of driving parameters to the driver. Electronic chromic mirror minimizes the glare caused by traffic at rear. A 4.3 inch TFT LCD touch screen manages the audio controls. All glass panoramic sunroof provide ample entrance of sun rays as well as fresh breeze. With refined feature and elegant aesthetics, this SUV has got a superior level of comfort. Smart key entry enable easy opening of the doors without engaging the key. Engine start-stop feature of the SUV enable the driver to start the engine with just a push of button. Power windows to each door comes with driver auto up and down feature. Glove box of the SUV offers cooling facility, that keeps your drinks and eatables fresh for hours. Storage areas and cup holders are provided near the center console for easy storage of useful amenities. Active head restrain and 8-way power adjustable driver seat makes you feel cozy through out the journey. With a long wheelbase, the SUV offers a legroom of 1049mm at the front and 955mm at the rear. The generous space of this Kia Sorento accommodates a decent boot space of 258 litres. Fold the 3 row and you can increase the boot space to 1047 litres. A 6-Speaker sound system of this Kia Sorento transforms the cabin into a concert hall. Its 4.3 inch TFT LCD touchscreen provides you with audio controls through which, you can manage the audio system. The audio system of the car is compatible to Radio/CD/MP3 players. Control of the audio can also be done through steering mounted controls, so that you can mange the audio without letting your hands off the steering wheel. USB and AUX connectivity allows you to switch to your favorite list of songs by connecting iPod or other external devices. A 12 V socket equipped in the console area enables you to charge your phone during long travels. The 4.3 inch screen lets you see the rear view camera display. Bold and dynamic look of the Kia Sorento claims the reason behind its elegance. Facelifted Kia Sorento has a tail design this time. The wide open honeycomb radiator grille toned with mat black finish enables sufficient gasping of air to the engine bay. Auto leveling HID projector head lamps integrated with daytime running lights adds to the masculine silhouette of the front. Besides providing easy vision in foggy days the fog lamps equipped in the bumper has static bending light feature, which illuminates the corner area while turning. LED rear combination lamps throw a sporty impression at the rear. Roof rails on the top allows sufficient transport of outdoor equipments. Electronically folding and electrically adjustable wing ORVM is integrated with LED repeater lamps for better safety while turning. Chrome finished door handle comes with pocket lights, which enables one to locate the handles even in dark. All glass panoramic sunroof equipped in the car gives a luxurious touch to the SUV. Diamond cut alloys of the car are machine finished and adds equally to the glamor of the SUV. Spoilers and air diffusers at the rear adds to the aerodynamic factor by cutting the drag force created by the resistive flow of air. The LxBxH dimensions of this Kia Sorento are 4684mmX1885mmX1709mm respectively. Much talked ground clearance of the SUV is 183 mm, which is sufficient enough to encounter off-road tracks. The wheelbase of the this SUV is 2700 mm. Besides providing good stability, the machine finished diamond cut alloy wheel add to the elegant silhouette of the car. This 18 inch alloy embraces a tyres of size 235/55 R18. With the introduction of Theta II engine there is a considerable hike in the mileage as compared to its predecessor. The dual continuously variable valve lift technology in this engine alters the valve opening and closing height according to engine load, resulting in proper combustion. Having a combined mileage of 11.9 km/l, the SUV is economic enough for long runs. The 2.4-litre naturally aspirated gasoline engine churns out 174 hp of peak power at 6000 rpm and yields a maximum torque of 277 Nm at 3750 rpm. This engine is equipped with dual continuously variable valve lift (DCVVL) technology, which alters the valve opening and closing height according to engine load conditions, thus resulting in proper combustion. Its all wheel drive train configuration allows the vehicle to encounter off-road tracks with ease. The 6-speed automatic transmission is coupled to the engine that enables easy and brisk switching of gears. The naturally aspirated 2.4 L petrol engine churns out a maximum power of 174 hp at 6000 rpm along with a pounding torque of 227 Nm at 3750 rpm. Its 6-Speed automatic transmission gearbox eliminates the tiresome shifting of gears and offers easy along with brisk gear switching, resulting in improved acceleration. Claiming to reach 100 km/h in just 10.5 seconds, the brand figures a top speed of 190 km/h. Braking system of this SUV comprises of ventilated disc type at the front and solid disc type at rear. The ABS/EBD system equipped in the car offers equal amount of braking pressure on all four wheels and prevents the locking of wheel. Flex steer system allows you to choose between three driving modes- Comfort, Normal or Sport. Combination of McPherson Strut suspension at the front and multi link rear suspension with gas shock absorbers at the rear provides a stable and comfortable ride through out the journey. This vehicle has 6-Airbag system (Dual front, side and curtain) offers ample safety during fatal incidents. Rear parking assist system alerts the driver while parking in tight areas. Vehicle Stability Management system avails you with couple of decent stability controls that prevents the vehicle from skidding and roll back. Electronic stability control (ESC) manages the coordination between engine torque and brake thus reducing the risk of skidding on sharp turns. Anti lock braking system (ABS) prevents the locking of wheel on sudden braking. Electronic brake distribution (EBD) offers equal amount of braking force to each wheel. Traction control system (TCS) prevents the slippage by providing adequate amount of traction to each wheel. Hill assist control (HAC) prevents roll back while driving in steep ascents and descents. It engages the brake even after releasing the pedal in order to get time for throttling. What are the Safety Features Available in Kia Sorento?